UPDATED FOR NEW LEGION AND CODEX RULES! When I started a Raven Guard army, one of the concepts I wanted to field was army of jump packers, preferably prickling with lightning talons. While fluffy and fun, the price of the standard assault marine makes this sort of list uncompetitive. However, with new pricing, we have a rebirth of both of these ROWs. They are completely competitive now. Behold the Angel's Wrath and Assault Vanguard Rites of War. Legion Assault Squads Deepstrike in First turn. Half the squads must deploy this way. Enemy model's within 12" of a legion assault squad may only snap shot. Assault squads gain the hit & run rule. The Angel's of Wrath and Assault Vanguard ROWs are very similar is that they offer hit & run and basically restrict units to fliers and deepstrikers. However, under closer inspection they are really quite different. Angel's Wrath gives hit and run to all jump infantry, but the Drop Assault ROW only gives the Legion Assault Squads hit & run. 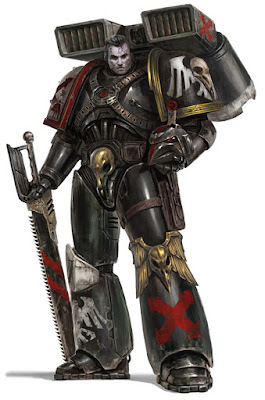 While a small distinction is most legions, in a Raven Guard force it means the Dark Fury squads don't get Hit & Run. Angel's Wrath Also opens up Storm Eagles as a transport allowing you to take basically any infantry unit in the list. Again a huge nod to Raven guard for units like Mor Deythan. In actuality, you don't even need to take Assault Squads, allowing for pure air cav. Assault Vanguard is is very restrictive, in that you must take Assault Squads as troops. Assault Vanguard gets some very cool rules like turn one deepstrike and the snap shot rule, which basically means they can be targeted by interceptor or by template weapons. While the assault Vanguard rules are very cool, they are some what situation. For one, it's very difficult to get any sort of deepstrike scatter reduction. The best I have come up with is a forge lord with vox on a jetbike in a squad with a vigilator with a jump pack. This scouts a unit up before the game and gives an area of scatterless deepstrike near the enemy. Another issue is the 12" range snap shot rule. Any army can bubble wrap for push back and blow you off the board still. Finally, no hit & run for Dark Fury or destroyers just kills the image I have in my head or lightning claw jet packers hit & running all over the board. It was soooo close, but it's just not that good for RG. Angel's Wrath is plain better. Interestingly, so is the Recon Company ROW. Comment if you disagree or think I have missed something. On a side note, I thought I would post a quick list concepts. With Angel's Wrath ROW. Ultiamtely, the concept of making assault marines work it is investing in them. Yeah... I know it sounds like a horrible idea, but with Hit and run and chaplains you can use the Assault marines as a tar pit and just multi charge as many units as possible. Melta bombs are a threat to all vehicles and teh Dark fury clean up the rest. Conceptually, I think you just start everything on the table and use terrain to approach. These lists also works with Drop Assault Vanguard. In that scenario everything starts in reserves. Assault marines come down first turn. The Dark Fury will come in later. I would have to field it to see if it works, but I don;t like the piece meal approach as the gap between first turn and when Dark Fur squad could come in might be too long. On a final thought, you could do something similar with Recon squads where you take 3 recon squads, 1 assault squad and 3 dark fury squads. Plus in this situation you run 3 vigilators and a praetor. It's actually probably the best version with the 2+ saves.